In our continuous attempt to improve our lens database and provide all the necessary information about various lens manufacturers as well as individual lenses, we’ve already discussed different abbreviations used to describe Sigma, Fujinon, Nikon and Canon lenses. In this article, I will talk about the most popular abbreviations used with Sony lenses. It is worth noting that Sony has a rather special relationship with the legendary German lens manufacturer, Carl Zeiss. As far as I know (and do correct me if I’m wrong), these Sony-Zeiss lenses are not actually designed by Carl Zeiss. Rather, they are merely approved by the legendary lens manufacturer as being good enough to carry Zeiss brand name. Whatever the case may be, as such lenses are officially supported, manufactured and distributed by Sony, they can be considered as brand lenses and not third-party offerings. However, they do share both Zeiss and Sony-specific abbreviations. In this article, I will focus on modern Sony lenses only. Zeiss lens abbreviations will be covered in a separate article. SAL – Sony Autofocus Lens, but perhaps better understood as Sony Alpha Lens as lenses that come with this abbreviation are designed specifically for the A-mount cameras. As with SEL, this abbreviation is only part of Sony’s short product name. For example, the Sony 24-70mm f/2.8 ZA SSM lens is also known as SAL-2470Z. DT – stands for “Digital Technology” and specifies lenses that are designed for cameras with APS-C sensors. These lenses do not cover the full 35mm sensor image circle, much like Nikon DX, Canon EF-S and Sigma DC lenses. That said, DT lenses can be mounted on full-frame Sony cameras and used in crop mode effectively turning a full-frame Sony camera into a cropped-sensor camera. SEL – specifies Sony autofocus lenses designed for their E-mount mirrorless camera system. As with SAL, this abbreviation is only found in the short product name. 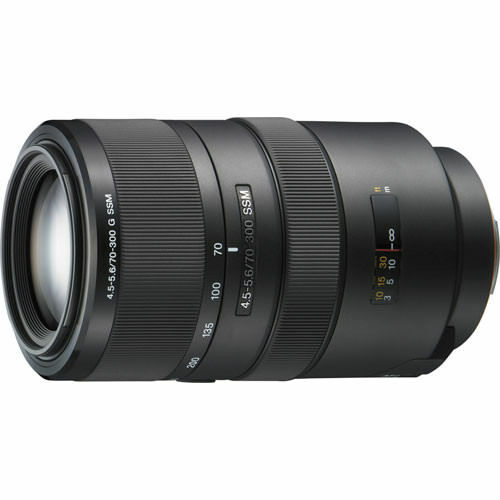 For example, the Sony E 16-50mm f/3.5-5.6 PZ SSM lens is also known as SELP1650. FE – lenses that cover a 35mm sized sensor and are designed to be used with Sony’s full-frame mirrorless cameras, such as the Sony Alpha A7. E – lenses designed for Sony’s mirrorless cameras with APS-C sized sensors, such as the Sony Alpha A6000. G – stands for “Gold” and specifies Sony’s best, highest-quality, most expensive professional lenses. ZA – Zeiss Alpha, Zeiss branded lenses designed specifically for Sony cameras and, as far as high-quality goes, these are on par with Sony’s G lenses. During my research, I’ve found differing opinions, but as far as I know ZA lenses are not actually designed by Zeiss. Designing and manufacturing these lenses is still up to Sony, but only when the optical design is approved by Zeiss according to their high standards. SSM – SuperSonic Motor, Sony’s version of a ring-type ultrasonic motor used for extremely fast and silent AF operations. Minolta A-mount camera bodies released before 2000 do not support SSM and you’d be left with manual focus only, but that’s unlikely to be a problem for most Sony shooters. SAM – Smooth Autofocus Motor is built into some of Sony’s lower-end lenses released since 2009. It’s sufficiently speedy and quiet, but not as good as SSM. The addition of SAM also usually indicates that the lens has a plastic build and is from the affordable range. Much like SSM, SAM does not work with pre-2000 Minolta camera bodies and the lens focusing will need to be done manually. OSS – Optical SteadyShot means that a particular lens has optical image stabilization. Sony Alpha mount lenses don’t have such a feature because Sony prefers to use sensor-based IS with its DSLR and SLT cameras. However, their mirrorless E-mount system relies on optical image stabilization instead. PZ – stands for “Power Zoom” and specifies lenses that have inbuilt motors to operate the optical zoom. Useful for videography for the lens’ ability to zoom smoothly. PZ lenses are also quite compact for their class. ED – as with lenses from other manufacturers, stands for Extra-low Dispersion glass elements used in the lens’ optical construction and designed to reduce chromatic aberrations. TC – as with other manufacturer, stands for Tele Converter and means that this particular lens is designed to increase the focal length (and reduce the maximum aperture) of telephoto lenses. Fisheye – Fisheye lenses, as you already probably know, provide extremely wide angles of view (180 degrees is not uncommon). What makes them distinctively different from regular wide-angle lenses is the very strong and unique distortion characteristics. Diagonal fisheye lenses cover the whole frame, whilst circular lenses produce a circular image within the frame. Read this article if you want to learn more and see some image samples. Pancake – Sony’s lenses designed with extremely compact size and light weight in mind. Macro – as with lenses from all other manufacturers, Macro lenses in Sony lens line-up offer higher-than-average magnification and are designed to work well at close focus distance. It is also worth noting that Sony doesn’t play around with the designation – if the lens is specified as Macro, it can achieve 1:1 magnification. STF – Smooth Transition Focus, lenses that employ special APD lens groups that get thicker towards the edges and, because of that, reduce the amount of light passing through. Basically, these lenses are designed to deliver extremely smooth, silky out of focus highlights, but with some trade-offs, chief among which is the lack of autofocus. Also, even though the physical maximum apertures of STF lenses are generally wide, the actual amount of light coming through due to APD lenses is much lower (the difference between lens’ f-stop and t-stop can vary up to one and a half stop of light, meaning an f/2 STF lens would let in approximately as much light as a regular f/3.2-3.5 lens would). Finally, and this is a personal opinion, I find the excessively smooth rendition of out-of-focus areas to look lifeless, characterless and “plastic”. However, if you want a lens that delivers what is considered to be a superbly silky out-of-focus background/foreground with high image- and great build quality, and don’t care about lack of AF, a lens such as the Sony 135mm f/2.8 (T4.5) STF may just be what you are looking for. Having covered the most frequently seen Sony lens abbreviations, we can now analyze the name of an actual lens. Perhaps the 70-300mm F4.5-5.6 G SSM? First things first – the lens obviously has a variable focal length that can be set from 70mm to 300mm and the maximum aperture starts at f/4.5 on the wide end and gradually closes down to f/5.6 as you move towards the long end of the focal length range. The G letter indicates it is part of Sony’s “Gold” range, as as such is built very well with tight tolerances, high-quality materials and best optics the manufacturer could come up with. SSM means that the lens also has a ring-type ultrasonic motor for AF operations, so autofocus should be both swift and nearly silent. However, if you were to mount this lens on a pre-2000 Minolta SLR body, you’d be left with manual focusing only. The lens itself is designed for full-frame A-mount cameras and two aspects indicate this: first of all, there are no FE, E (to indicate E-mount compatibility) or DT (to specify the lens as designed for APS-C sensor cameras) definitions; secondly, the short product name of the lens is SAL70300G, and, as we know, SAL indicates that the lens is designed for A-mount cameras. If you read the lens description you will also notice it has ED elements to counter chromatic aberrations. Have I missed anything? If so, please let me know in the comments section below! May I have permission to use this article in teaching about lenses, with proper attribution to you and your website? We have one student currently using the Sony cameras (the rest are using Nikon and Canon and we have the abbreviations for those lenses already). Thanks. forgive me for not getting back to you earlier. Yes, of course – this is why this information is here! So, essentially there is no designation that identifies Sony A Mount full frame lenses, yes? Just the lack of other discriminators i.e. FE for E-mount, DT for crop sensor. How does GM differ from G? I would recommend the Rokinon 12mm f2.0 wide angle lens. It’s a budget friendly lens but it’s very sharp. Great value overall. One thing to have in mind is that it’s manual focus only. Check at the back of lens cap. You will see either its 40.5mm/49mm/52mm etc. What is the diffeence between SSM and SSM II?